Everybody, on your mark… get set… and race your way to fun with Chuck and his very best friends — Digger, Handy, Rowdy, Biggs, Boomer and Flip! Join the gang as they race each other to win a radio contest, form and astronomy club, create the perfect Mother’s Day gift and more. Strap yourself in, sit back and enjoy the ride! My little guy absolutely loves anything with wheels. He's almost two and can play and watch trucks for hours. 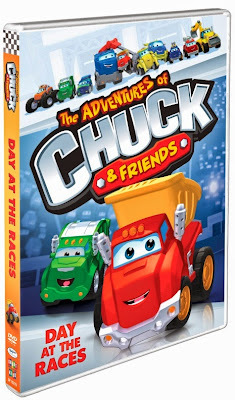 So I was excited to get the opportunity to review the latest DVD from The Adventures of Chuck & Friends: Day At The Races. This show not only keeps my little boy entertained for hours, but I love how there is always a message involved in each episode that will also teach my son about sharing, caring for others and being a great friend. This DVD comes with ten episodes plus the bonus feature of a new sing-a-long which he loves. He dances to it every time it comes on. This is a great show for little ones. The Adventures of Chuck & Friends: Day At The Races is now available on DVD retailing at $12.99. For more information about this DVD and other The Adventure of Chuck & Friends be sure to head over to www.shoutfactory.com. Disclosure: All opinions are my own. I received The Adventure of Chuck and Friends: Day at the Races at no cost for the purpose of this review. No other compensation was received.